WTF?! 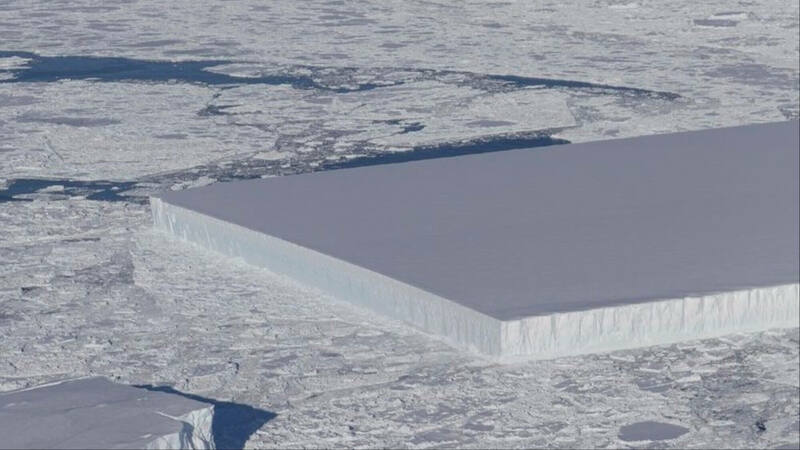 NASA has released an image showing an iceberg in Antarctica that appears so rectangular and flat, it looks purposely cut into shape. But alien conspiracy fans will be disappointed to learn that it’s a naturally occurring phenomenon. The image was taken as part of NASA’s Operation Icebridge, which involves photographing Earth’s polar ice to better understand connections between polar regions and the global climate system. Although it's often said that there are no straight lines or perfect 90-degree angles in nature, they do happen, albeit rarely. While most of us think of icebergs as pointy chunks of ice with their spires sticking out of the water, these tabular icebergs are quite different. As the picture shows, tabular icebergs are large slabs of ice with nearly vertical sides and flat tops. They’re usually formed when breaking off from ice shelves; in this case, it likely came from the deteriorating Larsen C—the same shelf that saw a 2,200 square-mile, trillion-ton iceberg break away last year. “We get two types of icebergs: We get the type that everyone can envision in their head that sank the Titanic, and they look like prisms or triangles at the surface and you know they have a crazy subsurface. And then you have what are called ‘tabular icebergs. '” Kelly Brunt, an ice scientist with NASA and the University of Maryland, told Live Science. As the sea and wind haven’t eroded the iceberg’s clean edges, it’s thought that it must have cleaved away only recently. The berg is estimated to be more than one mile across and, like all icebergs, just 10 percent of its mass is visible above the surface.